These Lemon Custard Meringue Cups are a huge favorite around our house. 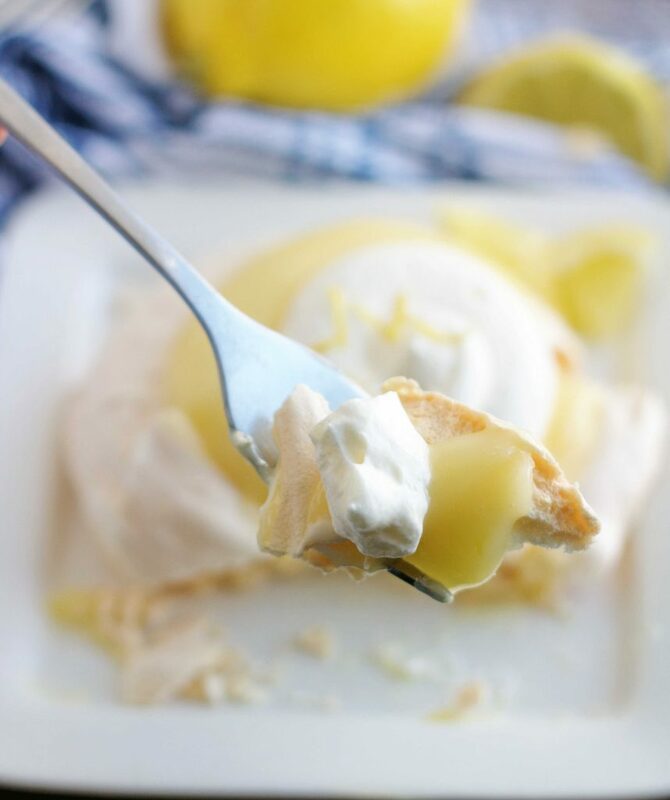 A delicious, sweet, crunchy meringue shell filled with lemon custard and topped with sweetened whipped cream. They’re the perfect dessert. It’s officially been spring for a little over a week now and I’ve been dying to start cranking out all things lemon. Even though this Utah weather has been its normal bi-polar self, it hasn’t stopped me from pulling out my lemon recipes. So many recipes coming your way, so I apologize to any lemon haters out there. Anyway, the first time I made these Lemon Custard filled Meringue Cups was probably about 20 years ago (yikes!!) and it was love at first bite for all of us. I took them to a family dinner at my mom’s house and everyone went nuts over them. Are these not just the cutest looking desserts ever? 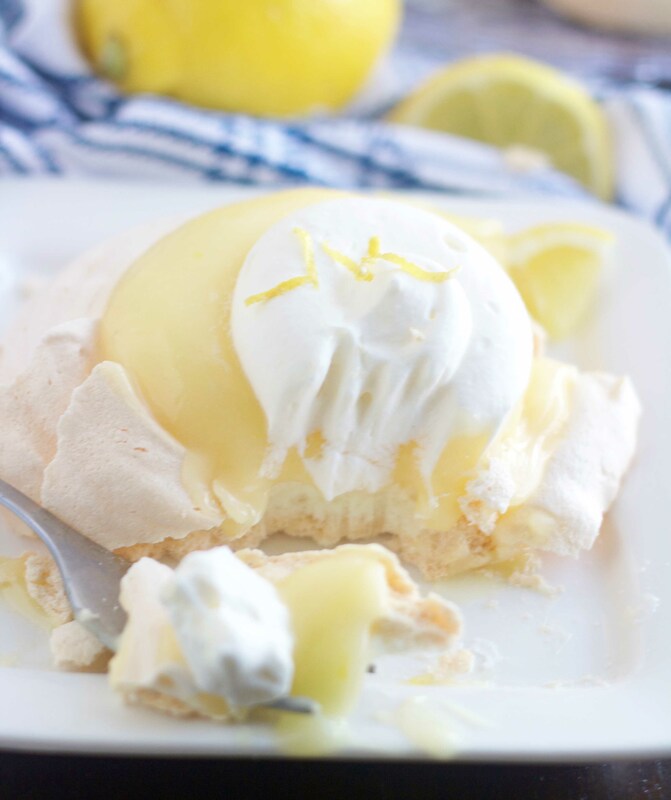 Not only do I love lemon, but I also love sweet, crunchy meringue shells. So putting the two together is seriously a little taste of heaven. 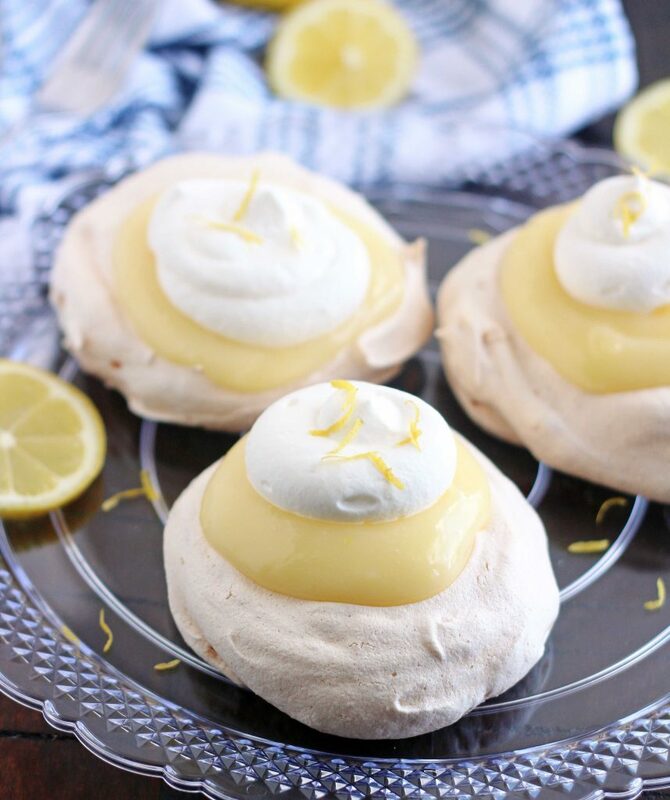 They’re actually really simple to make and both the meringue cups and lemon custard can be made ahead of time and then assembled an hour or so before you’re ready to serve them. These would be the perfect dessert for your Easter dinner this weekend. I hope you all have a fabulous Easter weekend. In a large bowl, beat the egg whites, vinegar, vanilla and 1/8 teaspoon salt on medium speed until soft peaks form. Gradually beat in 1 cup sugar, 1 tablespoon at a time, on high until stiff glossy peaks form and sugar is dissolved. Line baking sheet with parchment paper. Spoon egg white mixture equally into eight mounds on paper. Using the back of a spoon, make an indentation in the center of each mound. Bake at 300° for 30 minutes. Turn oven off and leave door closed and let the shells dry in oven for an hour. Use a small spatula to carefully remove the shells from paper. In a small saucepan, combine the cornstarch and remaining sugar and salt. Stir in water until smooth. Cook and stir over medium-high heat until thickened and bubbly. Reduce heat and cook and stir 2 more minutes. Remove from the heat. In a small bowl, beat egg yolks. Whisk a small amount of hot mixture into the egg yolks and then return the egg mixture to the pan stirring constantly. Bring to a gentle boil and cook and stir another 2 minutes. Remove from the heat and gently stir in the lemon juice, zest and butter. Cool to room temperature without stirring. Place a piece of plastic wrap right on top of the custard and chill. Just before serving, fill meringue shells with custard and top with sweetened whipped cream. You can make these smaller if you'd like. I've done that before and made 12 meringue cups instead of 8. My boys love anything involving a meringue shell, so they love the bigger size, but making 12 instead of 8 still makes a perfect size dessert. The shells can be made ahead of time and stored in an airtight container, or sometimes just leave them on the cooling rack and cover them with a towel. I like to make them the night before so that's one less thing I need to worry about. I make the custard filling either the night before or the morning of the day I'm serving them. It takes several hours to chill so making it the night before gives it plenty of time to chill. Then I just whip some cream just before I assemble them. I usually will assemble them n hour or two before I'm ready to serve them and store them in the refrigerator until I need them. Oh my goodness, these bites of deliciousness have everything I love; definitely worth going off of my “no sugar” eating plan…. for just one meringue. So glad your son referred me to your blog….btw, he’s living in our home here in the California foothills; what a sweet young man! Hi Darlene!!! This comment just made my day and put the biggest smile on my face. I’m so glad Elder Ludlow referred you to my blog too, tell him thanks (lol!). 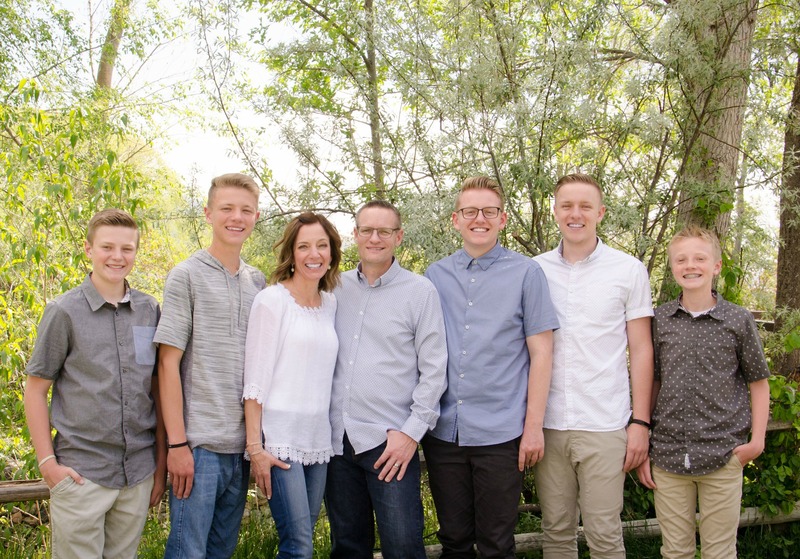 Thank you for taking in missionaries, that is so sweet of your family. He was so excited to get transferred to that area. He told us it’s been his “dream area.” Tell him hi and that we love and miss him. Take care and keep in touch. These were awesome! I loved every bite! Hi Pam! I’m so happy to hear you made these and loved them. Thanks for letting me know!